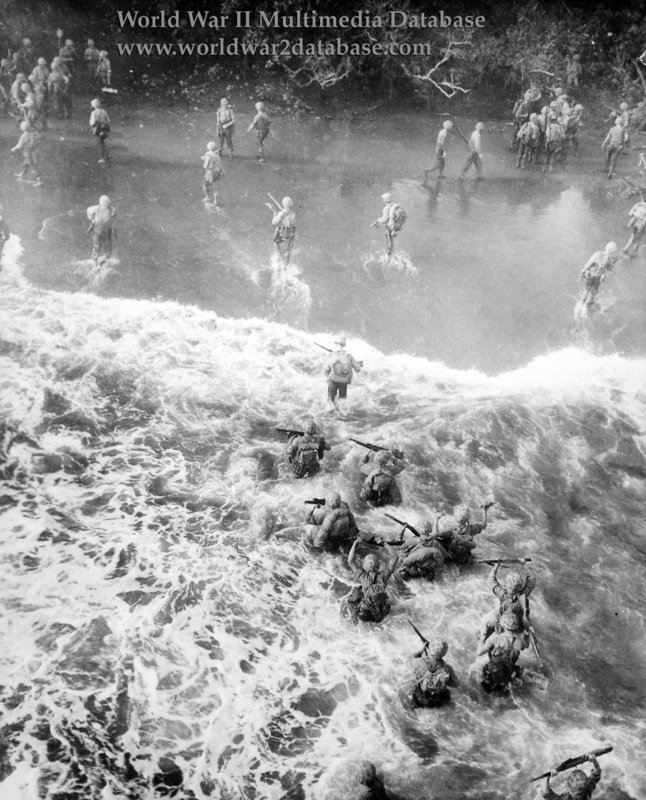 Soldiers of the 7th Marine Regiment, 1st Marine Division wade through a three-foot surf from Infantry Landing Craft (LCIs) to land on Yellow Beach. The Landing Zone was divided into two areas. The beaches themselves were excellent: a firm underfooting of black sand, almost entirely free of coral and shelving just sharply enough to permit even a large LST to ground within a dozen yards of dry land in many places. But they were shallow. As one Marine put it: "A tall man could lie with his head under the cover of the vegetation line and his feet out in the water." Beach Yellow 1, the westernmost, was about 500 yards long, bounded on the east by a 1,000-yard stretch of rocky shore line where jungle grew out over the water to provide a secondary barge hideout that serviced what aerial observers had spotted as a small supply dump and bivouac area immediately inland. Beyond this tangle lay Beach Yellow 2: approximately 700 yards long and terminating some 1,200 yards west of the tip of Silimati Point. The 7th Marines under Colonel Julian N. Frisbie, had the mission of setting up a beachhead perimeter as quickly and firmly as possible. The first wave of the 3d Battalion (Lieutenant Colonel William R. Williams) landed on Yellow 1 at 0746, the 1st Battalion (Lieutenant Colonel John E. Weber) on Yellow 2 two minutes later, both in landing craft from the APDs. Charging down the lowered ramps of their LCVPs, the Marines found themselves brought up short by a dense jungle. This they attacked with machetes and came presently upon a system of shallow rifle trenches and log-and-earth bunkers, all unmanned, and two dual-purpose 75mm guns standing abandoned. Beyond these, at varying distances, lay the motor transport road connecting the airdrome with Borgen Bay. The only live Japanese encountered were a handful of scared shipping engineers personnel cowering in dugouts, too stunned by bombing and gunfire either to fight or to flee. The assault troops gave these only cursory treatment, leaving mopping-up to support elements.